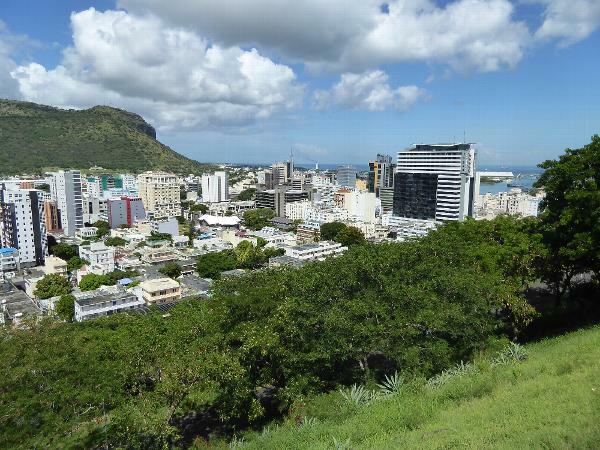 Europeans seem to like Mauritius; it's warm, has some good beaches, speaks French, and is accessible nonstop from London, Paris, and (seasonally) Frankfurt and Vienna. For Americans, it's different. They don't have to go so far for warm, good beaches. 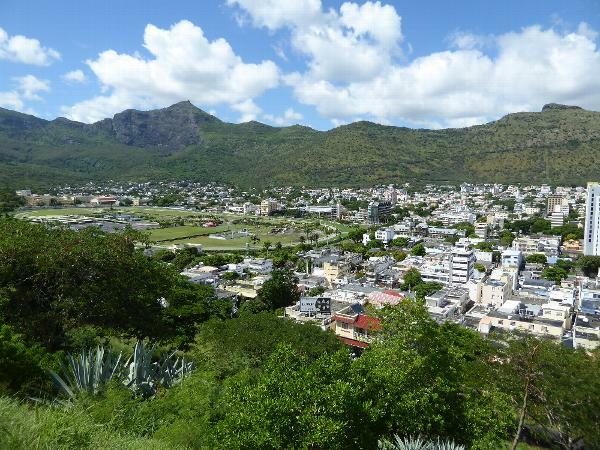 Not only that: Americans rarely speak French, and no American carrier flies to Mauritius, let alone gets there nonstop. So the island is off the American map. Saying that Mauritius is 500 miles east of Madagascar doesn't really help Americans, because they have only the vaguest idea where Madagascar is. So let's say Mauritius is 2,000 miles east of Johannesburg. Does that work? Maybe, maybe not: there's no fathoming American ignorance. We'll just have to put our lives in the hands of a pilot we've never met and let her fly us four hours east of Jo'burg to a speck in the Indian Ocean. Then we can snoop. Not what you expected? Well, Mauritius is all of 40 miles north to south and less than 30 east to west. Mind, it feels a lot bigger because there's a lot of topographic variation packed into the place, most of which is pretty empty. There are 1.3 million residents, but more than half are crowded into the capital city and its suburbs. 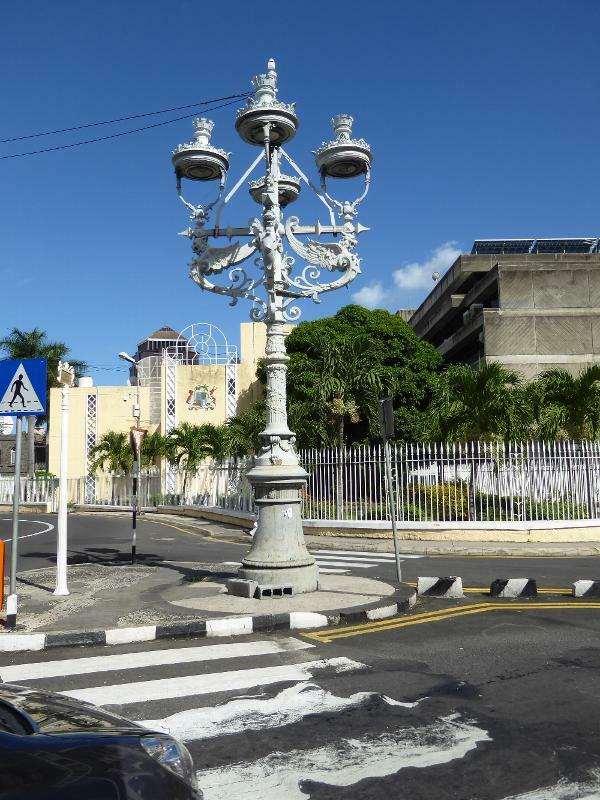 Here's the center of that capital, named for Louis XV, which brings us to the island's perplexing history. 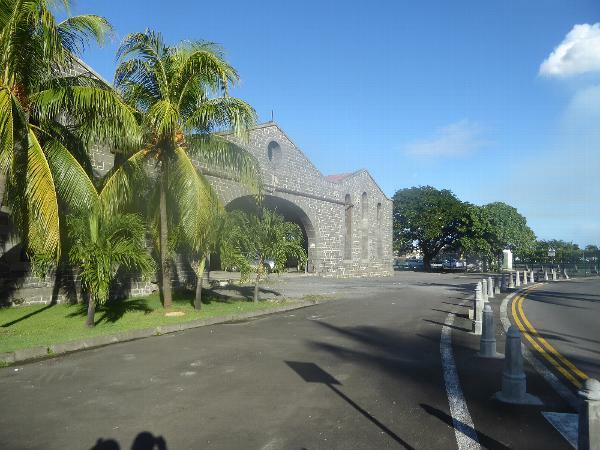 Apart from some escaped slaves seeking refuge, there was no one on the island when the French arrived in 1723. They held on until 1810, when the Brits took over. They in turn stayed until 1968. Do the math: you'd think just from the brevity of French rule that the island would have gone over to English. Not a prayer. 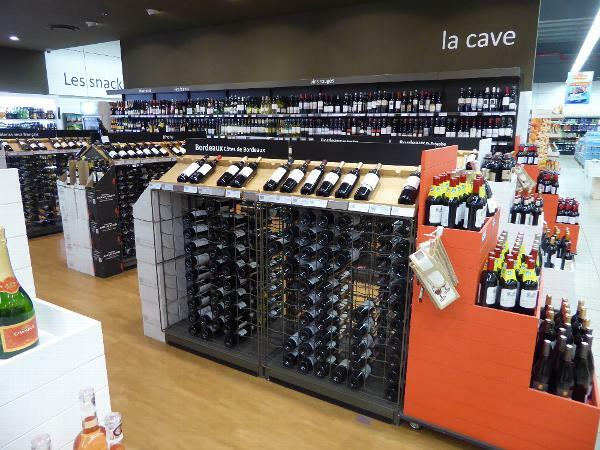 Somehow, the French elite co-opted the English. (Don't you love that loathsome word?) My guess is that the English officers enjoyed the opportunity to display their schooling. Anyway, we're on a hill called Petite Montague. Behind us is La Citadelle or Fort Adelaide, never used. That's Signal Hall across the way. Out there on a finger reaching into the sea you can see the white roof of the bulk sugar terminal built in 1980. We've panned inland to see the Champs de Mars, rimmed by the Turf Club's track. Setting it up, in 1812, was one of the first acts of British rule and a great way of making the British acceptable to the French. 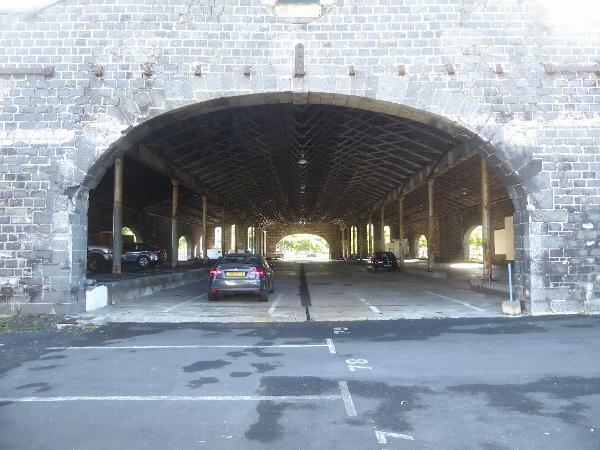 As its name suggests, the site had previously been a military parade ground. Before we get up close it's worth mentioning Mahé de La Bourdonnais, the founder of permanent European settlement on the island. 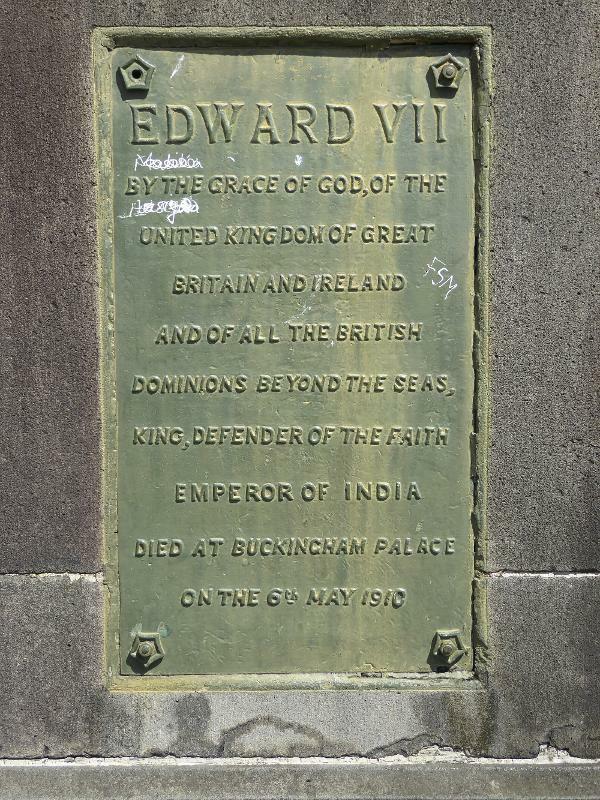 At age 19 he had entered the service of the French East India Company. Five years later he arrived in Mauritius, or Isle de France as it was then called. 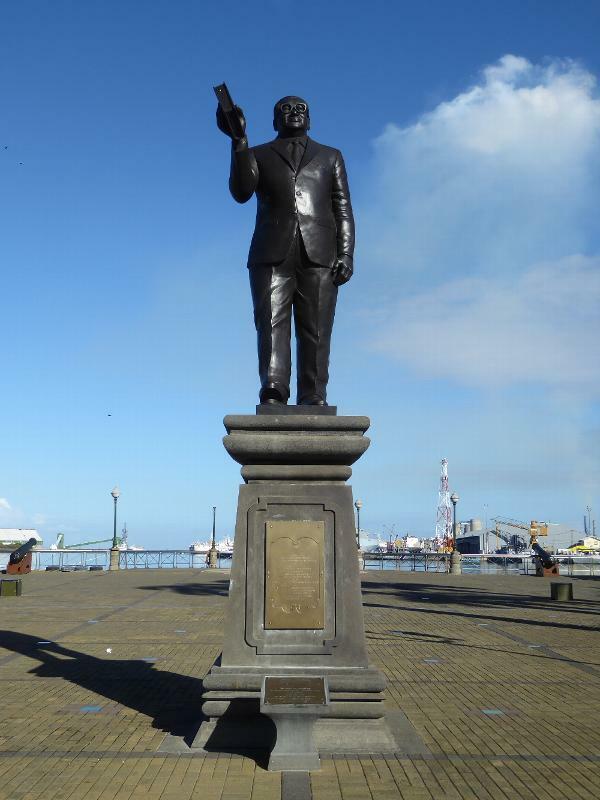 Ten years later, at age 34, he persuaded the Company to establish a naval base here. He was appointed governor and served from 1735 to 1747. He then returned to France and was tossed into the Bastille for two years. He was then found innocent, but his health was wrecked. He lived in poverty for a few more years, then had the decency to die. French rule would continue for another 60 years and under another 20 French governors. 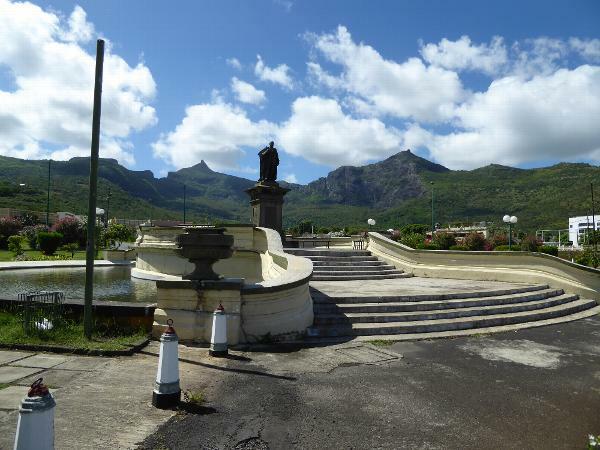 For the man who more than any other created Mauritius, the lesson seems to have been that no good deed goes unpunished. 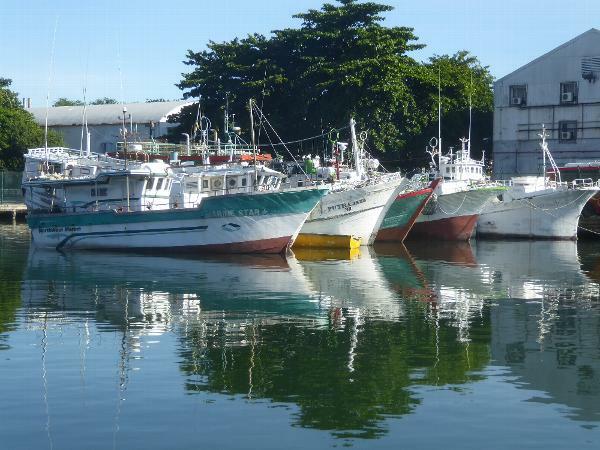 Port Louis is still an active port for fishing boats. The main business, however, has always been sugar. It's an industry that the French established but which the British put on an industrial footing. 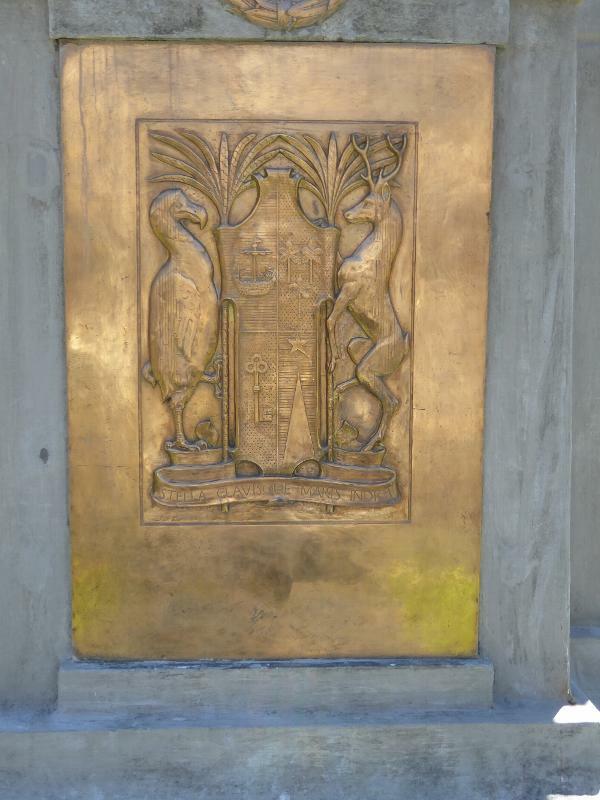 Here are the premises opened in 1901 by Blyth Brothers. In it they could pile up 100,000 tons of raw sugar. 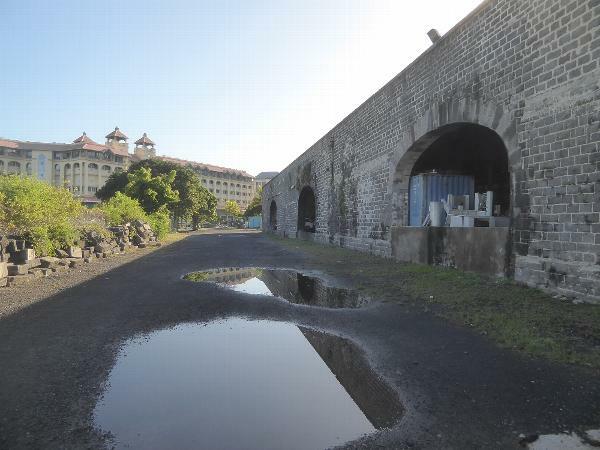 Old photos show heaps of it piled up alongside the tram lines that reached out to mills scattered across the island. 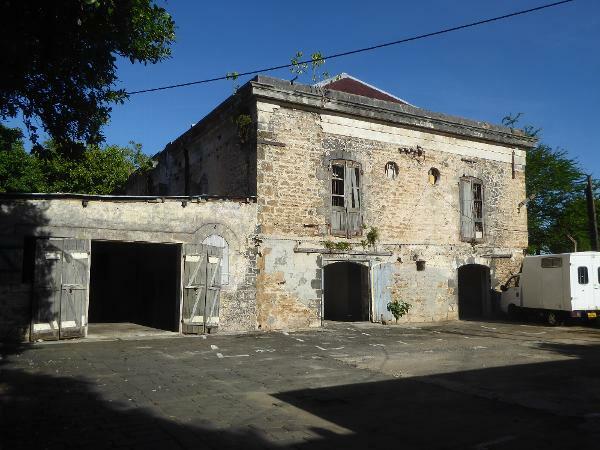 The warehouse also received sugar in shallow-draft boats coming from south-coast factories including those at Bel-Ombre and Souillac. 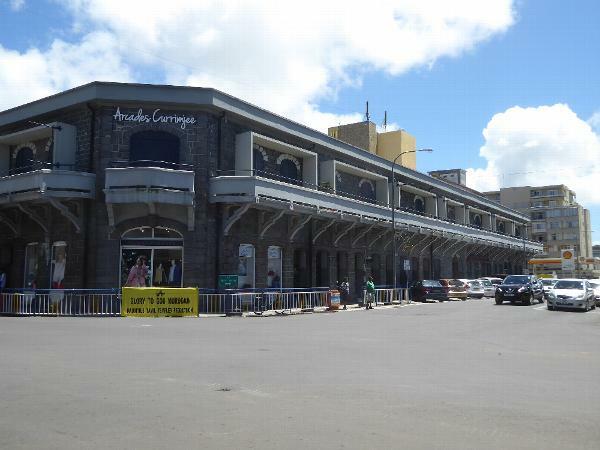 The opening of the bulk sugar terminal in 1980 freed up the waterfront for tourism development, and in 1996 the Caudan Waterfront opened on Barkly Wharf, previously used to store coal. Not very glamorous, so for a name the managers reached farther back to Jean Dominique Michel de Caudan who in 1726 had begun producing salt by evaporation. 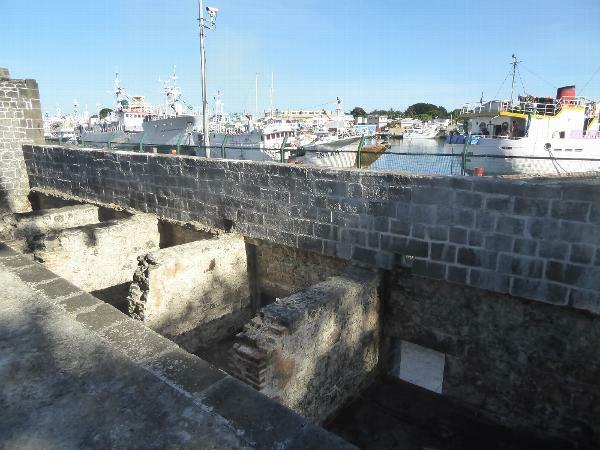 The process is still used not so far away, near Flic en Flac. Who can resist the lure of boutiques? We've tiptoed across the bridge. Shopping to the left, city to the right. 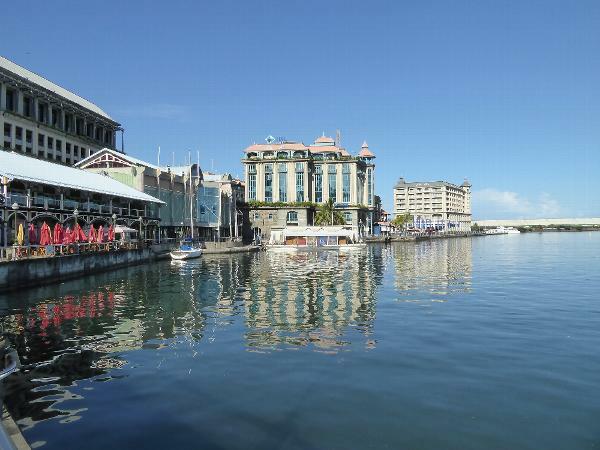 A hole in a fake hull leads to the Port Louis casino. 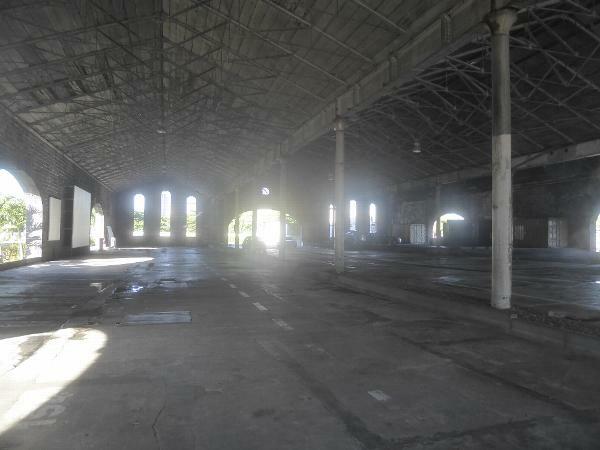 There's lots of space still to redevelop. 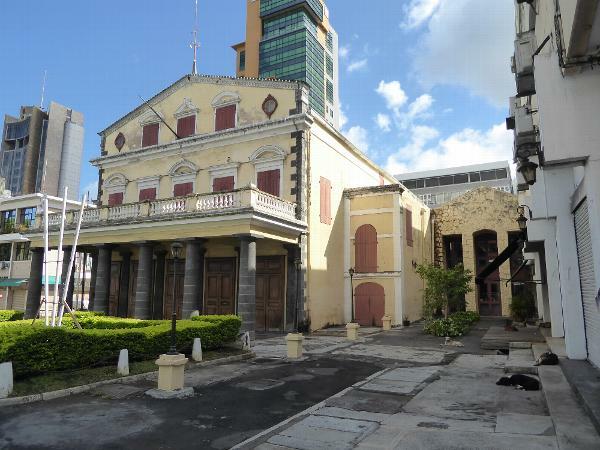 Here, at Place du Moulin, the State Property Development Company looks for investors. 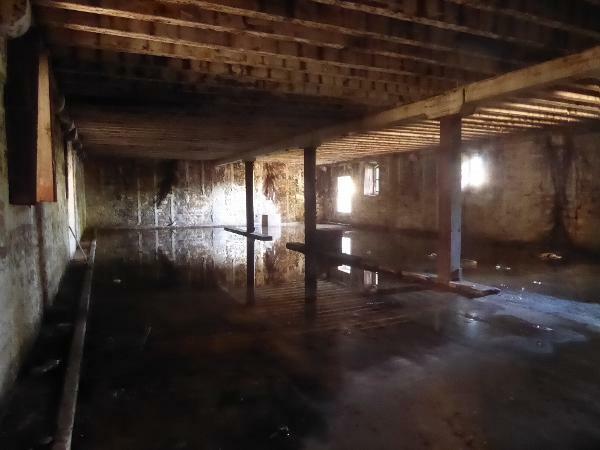 It's housed in a fine old building that will probably outlast all of us. 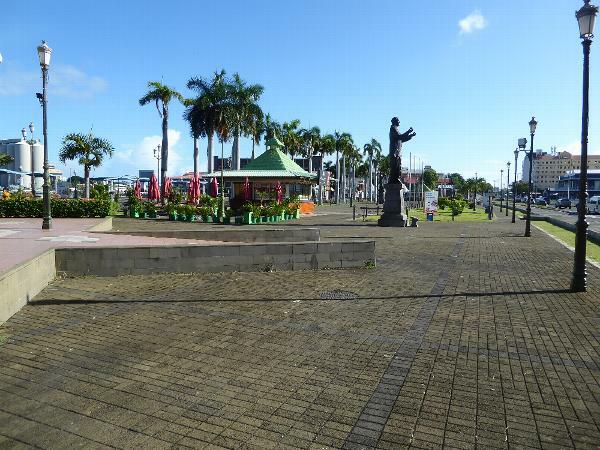 A promenade has been developed. 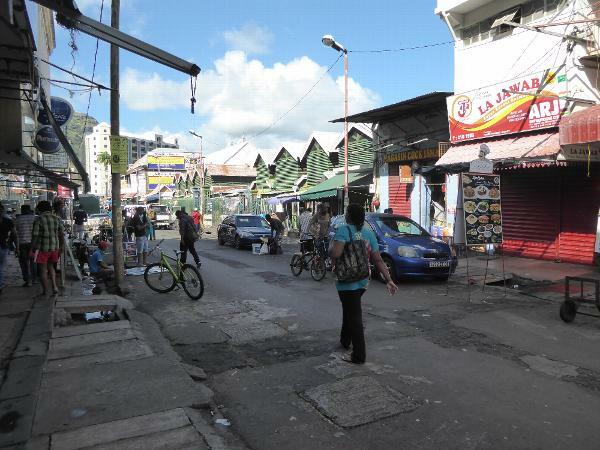 Which brings us to Basdeo Bissoondoyal and the 68 percent of the island's population whose ancestors came from India. 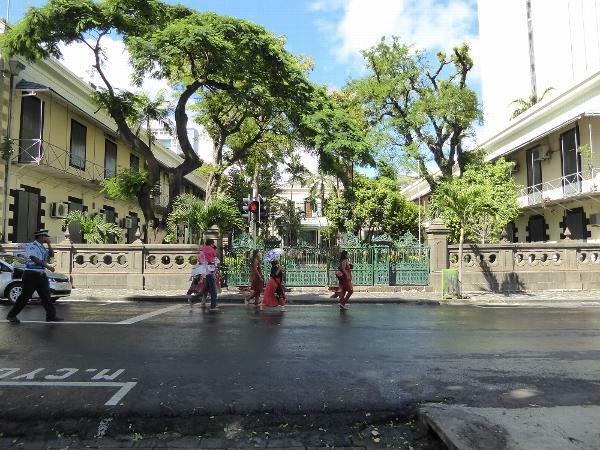 It's the usual story: somebody had to work the sugarcane fields, and after the Slavery Abolition Act of 1833 the plantation owners of Mauritius turned to indentured laborers from India. Between 1834 and 1920 about a half-million arrived. When their five years of servitude were completed, half chose to stay. Bissoondoyal (1906-1991) was born in a southern village surrounded by cane fields worked by a community which lived a lot like slaves. He was a brilliant student, however, and went to India, studied there, saw Gandhi in Lahore, and returned in 1939. The next year he wrote to the British authorities: "...I am a Hindu missionary. I have been delivering lectures on Hindu Religion for the last six months or so. I made it a point to seek the permission of the police even when it was not necessary because I wanted to make it clear that I am a man of religion and as such would be last to disturb public peace and tranquility..." It didn't work. As he later explained, "I did not know that I was asking for trouble. I soon got into scrapes." He was arrested in 1944, shortly after leading a satyagraha. Fast forward to this statue, which reminds passersby of Bissoondoyal's importance in the push for independence. Since 1968, every prime minister but one has been of Indian descent. See Jimmy Harmon writing in the Aapravasi Ghat Trust Fund Newsletter, 12 (2015). 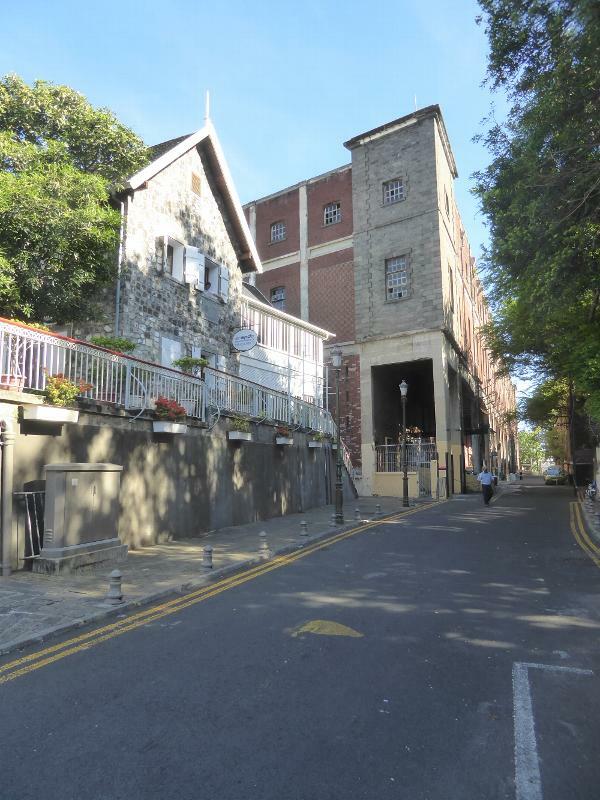 Basdeo is close to Sir Seewoosagar Rangoolam (1900-1985), whose father arrived from Bihar as an indentured laborer. 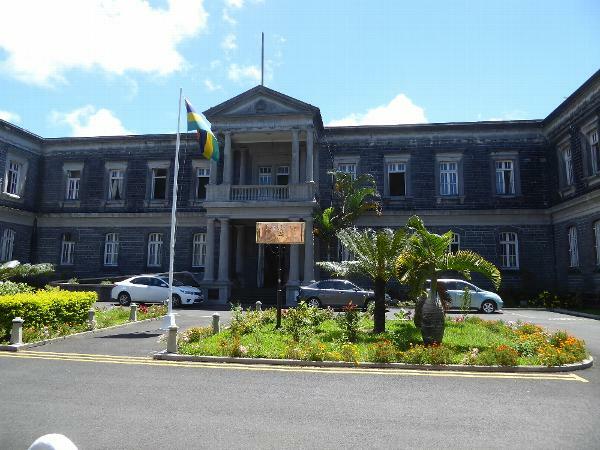 The son became a British-trained doctor and then the first chief minister (1961-68) and first prime minister (1968-1982) of Mauritius. 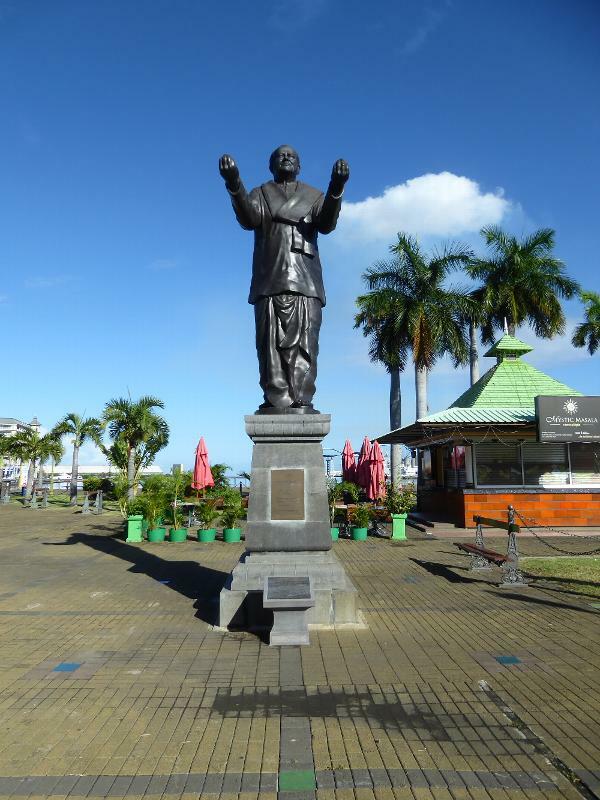 The island's international airport is named for him, and his face appears on every Mauritian rupee. We're heading over to Aapravasi Ghat, the new name for the Indian immigration depot, but here on the way is a warehouse yet to be restored. Original use? Probably to store rice. 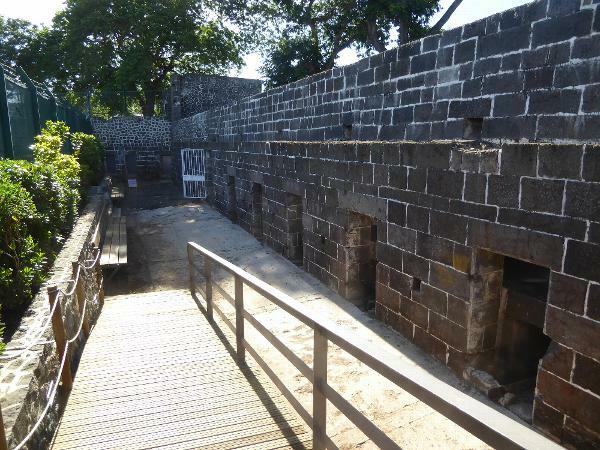 And here on the waterfront is the Aapravasi Ghat, on the UNESCO World Heritage list since 2002. Until 1987, it was called Coolie Ghat. Here's the view from the other side of the wall: cells to house the newly landed workers. It's a safe bet that few Europeans ever saw those quarters. 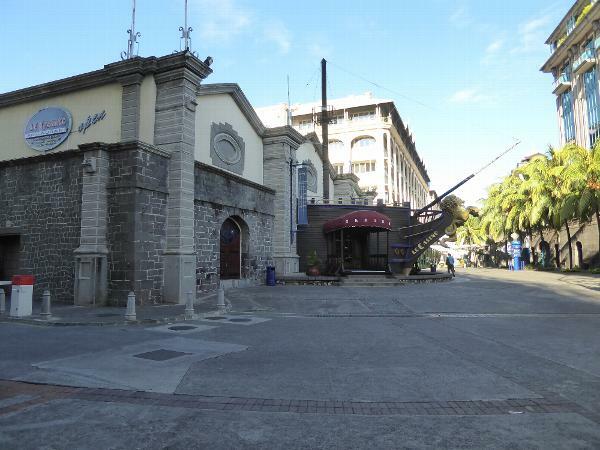 For them, Port Louis was a more genteel place with attractions such as this municipal theater. 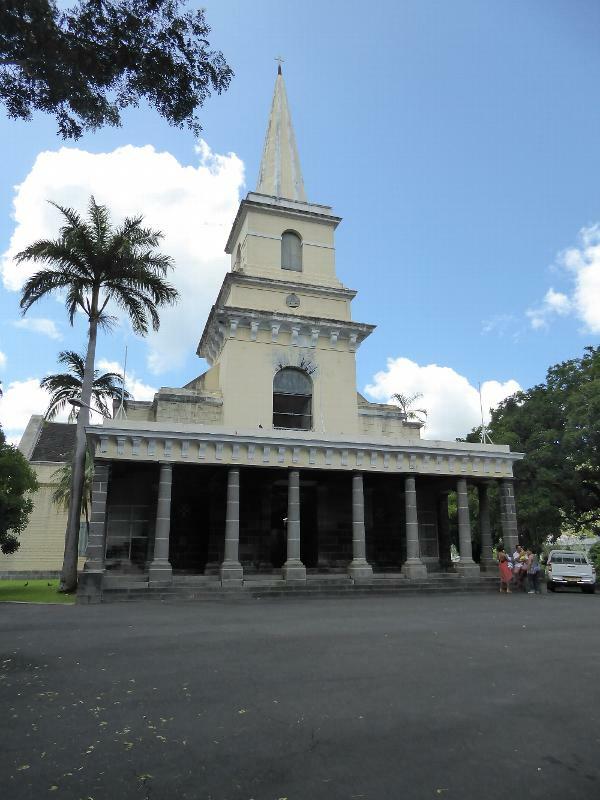 The first British governor of Mauritius, Robert Farquhar, laid its foundation stone, and the theater opened in 1822. Farquhar had previously been the lieutenant-governor of Penang. The Indian Ocean had become a British lake. Genteel indeed: a lamp post outside the theater. Like the lamps inside the theater, it was originally lit with coconut oil. The Palais de Justice was completed in 1851. The judges may have been British, but here they followed the Code Napoleon, and witnesses and defendants were permitted to speak in French or Creole. Lawyers had to use English, thank goodness. Here's the post office, built in 1868. The British established a natural history museum in 1842. 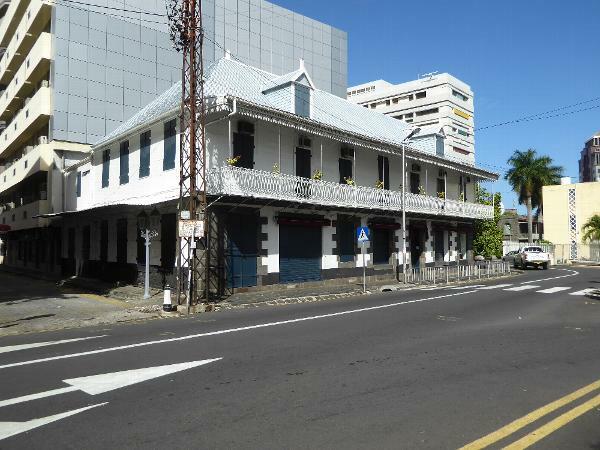 In 1885 it was moved here to the newly built Mauritius Institute. It's a reduced copy of the Colombo Museum, opened a few years earlier and a mere 2,400 miles to the northeast. 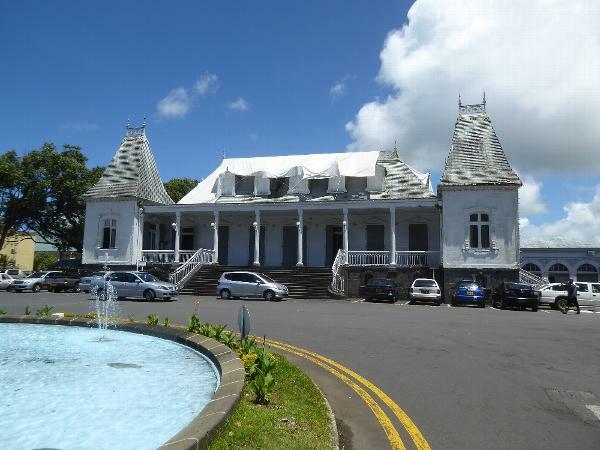 The British were still running the island when they added this Town Hall in 1962. Nice, huh? Independence didn't do much for architectural design. 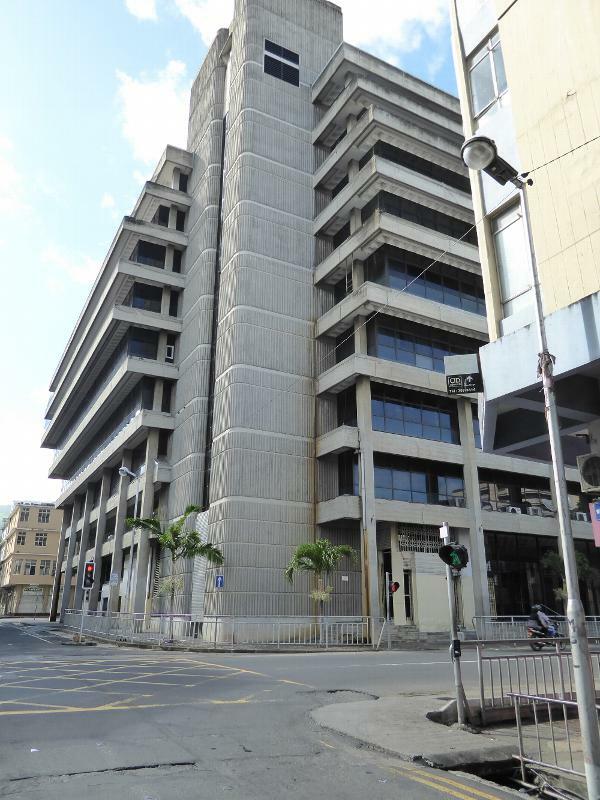 Here's a government-office fortress across from the town hall. 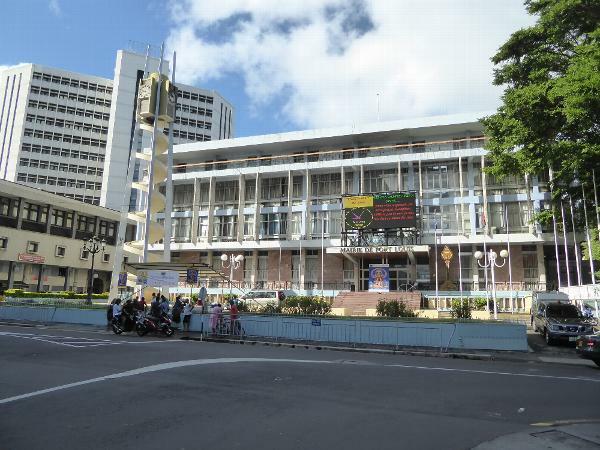 It houses several ministries including, ironically, the Ministry of Health and Quality of Life. 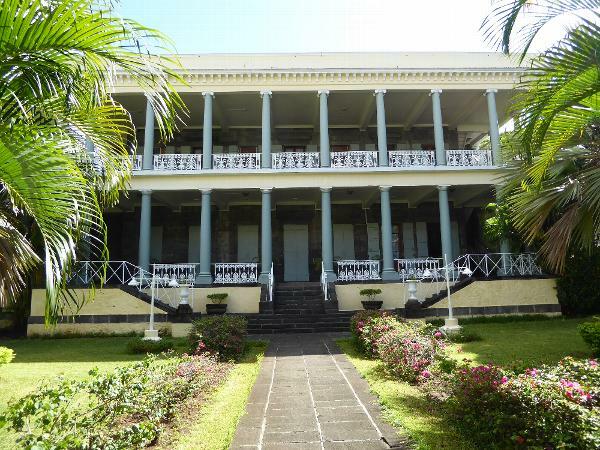 The island's elite was a plantocracy living on estates, and even houses in Port Louis displayed a plantation esthetic. 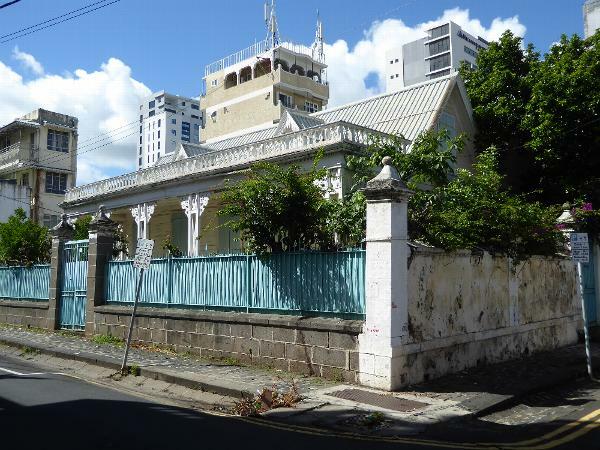 Not many such houses are left, because by 1900 almost all the Europeans in Port Louis had moved to suburbs, chiefly Curepipe and its neighbors. Here's a survivor. 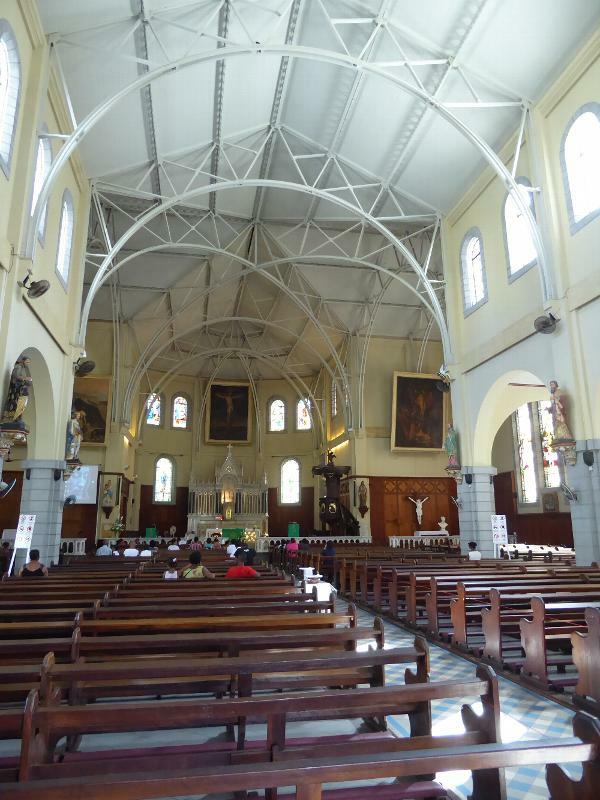 Here's a much grander place, the Catholic Bishop's palace. 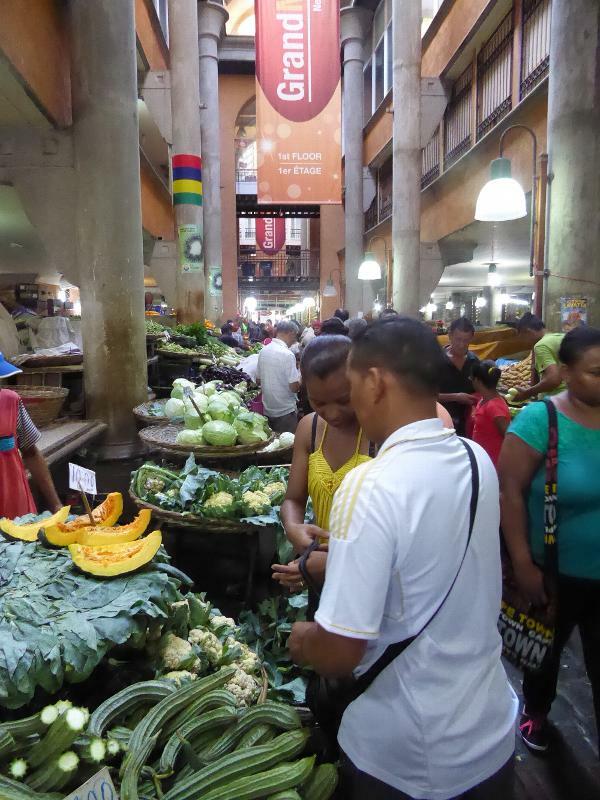 Shopping in the 19th century was concentrated in a downtown market. We'll take a look, but note that the streets aren't in great shape. Don't conclude that everyone's broke; instead, guess that people with money shop now in a suburban mall. Here's the entrance to what was called the bazaar. 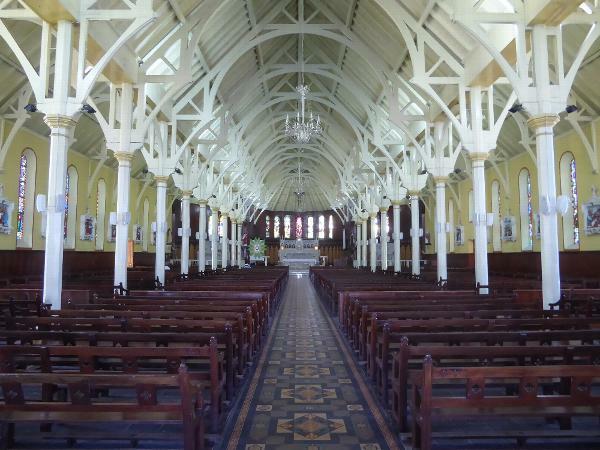 It was built in the 1840s by John Augustus Lloyd. Somebody? I'd say. 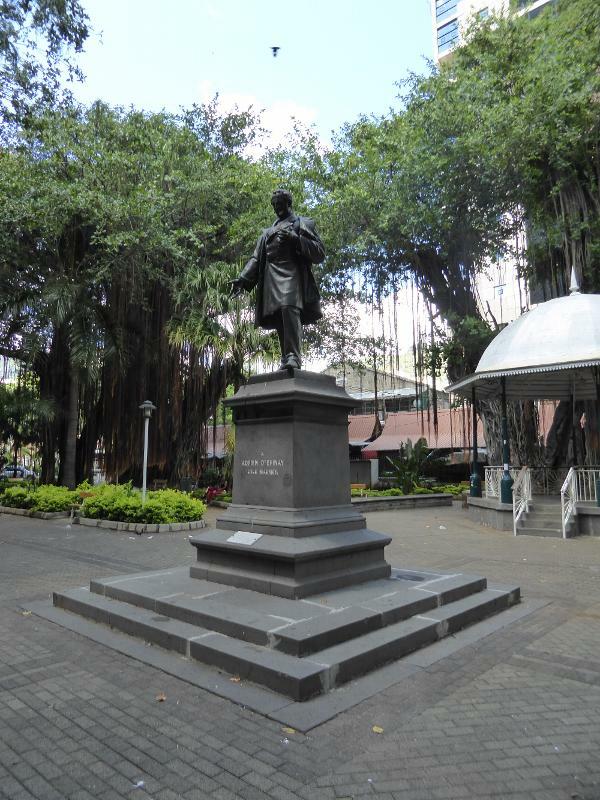 Early in his career he met and worked as an engineer for Simon Bolivar, for whom he surveyed the Isthmus of Panama and was almost killed in Cartagena. Returning to the UK, he became a fellow of the Royal Society. 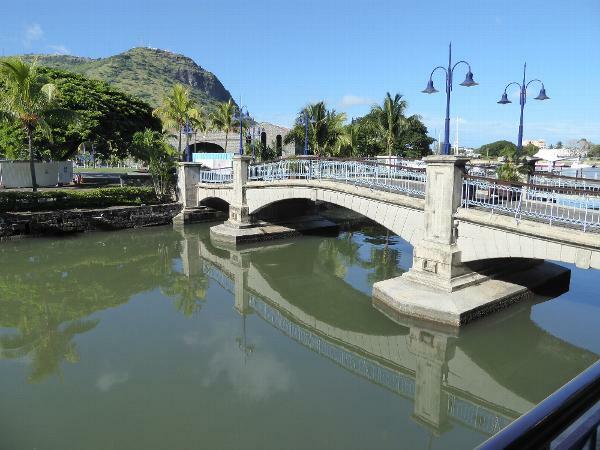 In 1831 he moved to Mauritius as the government's civil engineer and surveyor-general. 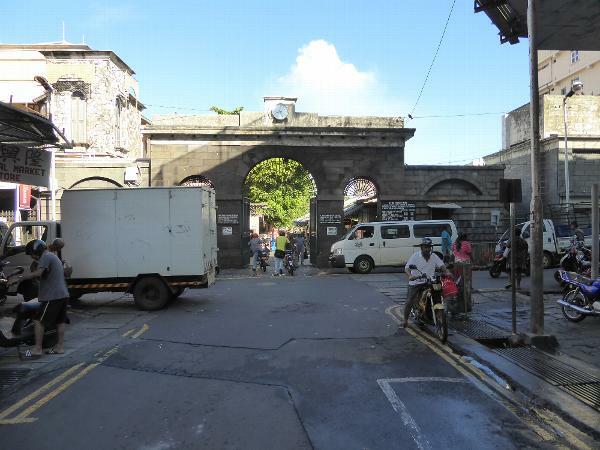 He was there until 1849 and in those almost 20 years built harbor improvements and many roads and bridges besides this market gate. 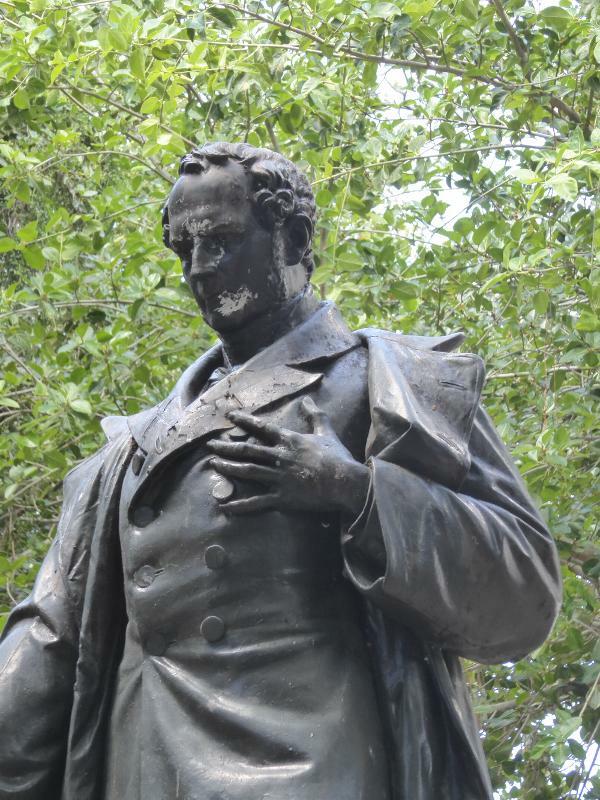 Back home in 1850, he became an advocate of a Panama Canal, but during the Crimean War he set out on a mission to provoke the Circassians against Russia. He was detained in the Crimea and subsequently died of cholera near Istanbul. A gate to the bazaar carries those initials found in so many countries: VR. 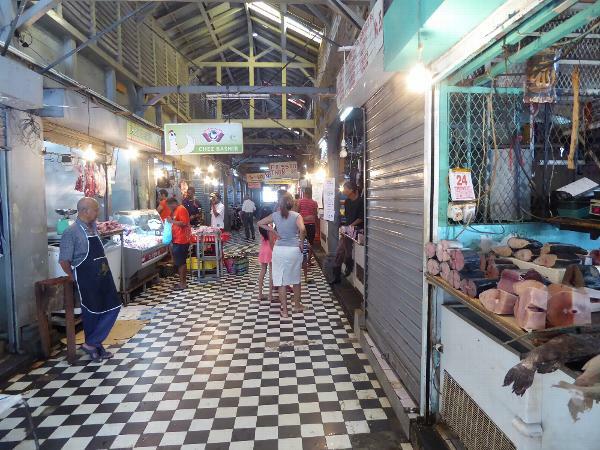 The market itself has been rebuilt since Victoria's time. 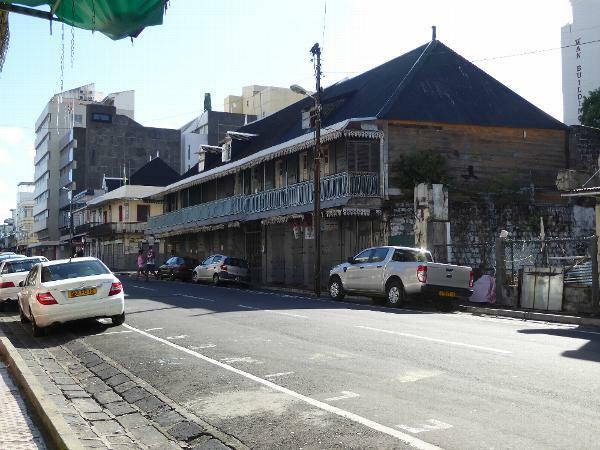 Port Louis businesses in the old days were typically housed in buildings like these. There's a nice description of them in a 1920s guidebook: "The streets and architecture have an old-world air and would seem to date from further back than is actually the case. Restrictions imposed by the climate are noticeable everywhere in the hurricane shutters made to close flush with the walls, and in the high kerbing and deep gullies which deal with the rush of rain-water from the high lands during the wet season. There is a noticeable absence of outside signs or indeed, of anything not strictly necessary, which might suffer from the fury of the winds." The phrase "fury of the winds" may be an allusion to a hurricane in 1892. 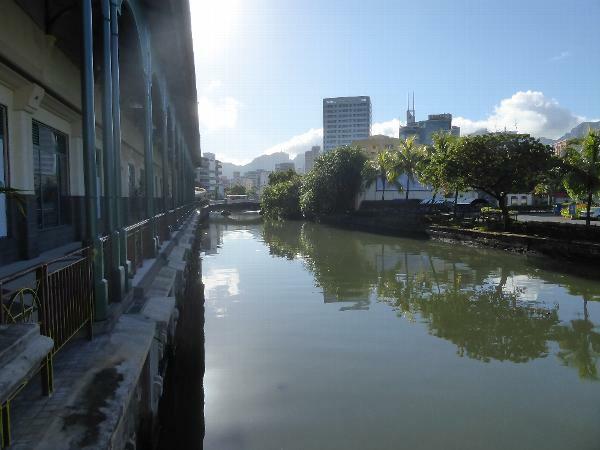 The next year a "great fire lapped up what the hurricane had left in the principal business area of Port Louis." See Union-Castle's The South and East African Year Book and Guide for 1929, p. 821. The quotation about the fire comes from the autobiography of Sir Charles Bruce, governor in 1900. See his Milestones on My Long Journey, 1917, pp. 91-2. Some old commercial buildings are still in good shape. Many are gradually being replaced. 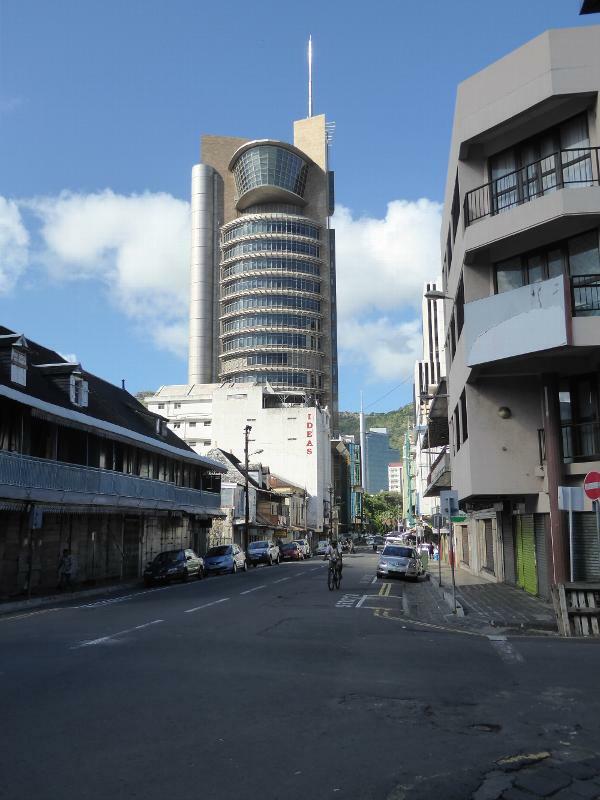 This tower, housing the Bank of Mauritius, thoughtfully provides an eyrie from which the titans can muse. The architect of One Cathedral Squarhad a stencil for Greek temples and just couldn't help plunking it down on his drawing. The obelisk used to be a fountain, but it's dried up. The statue is St. Louis himself, and he's gazing on the city's cathedral. Here it is. A parish church had been built here in the 1720s, but the foundation proved unstable, and the church was rebuilt in 1813. In 1847, it was elevated to cathedral status. In 1933 it was rebuilt again, this time with an iron frame. 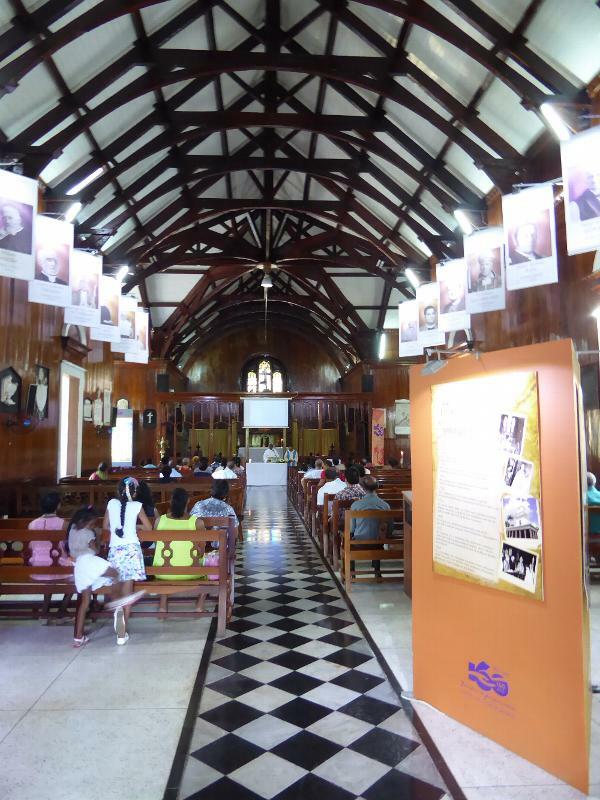 This is the nearby Anglican cathedral of St. James. Does it look sturdier? 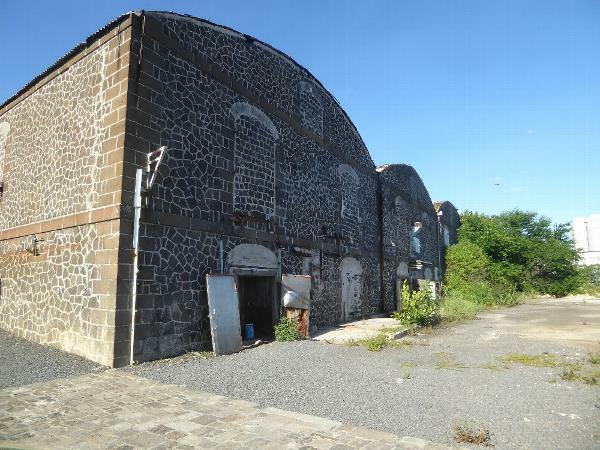 That may be because it started out as a powder magazine, with walls three meters thick. 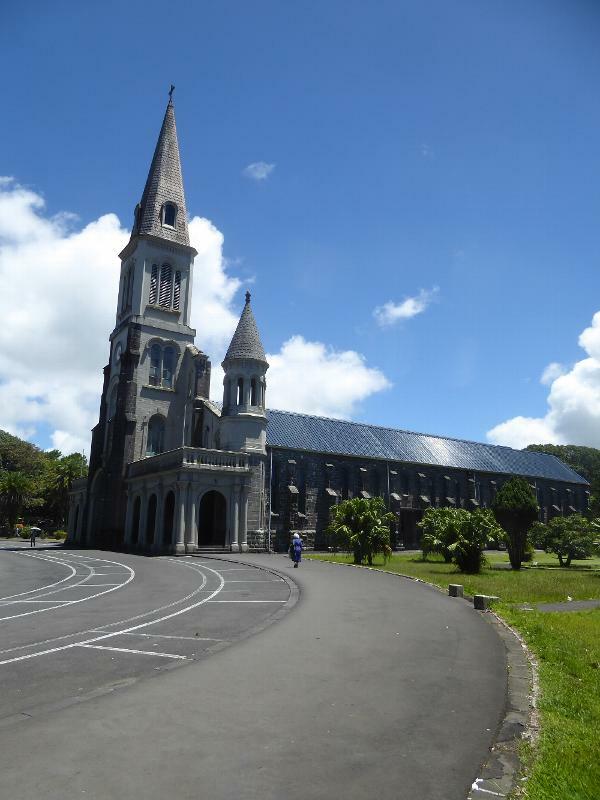 Consecrated in 1850, it got a veranda and leather-punch spire. Gwyn Campbell suggests that malaria killed Cole. See his David Griffiths and the Missionary History of Madagascar, 2012, p. 739. 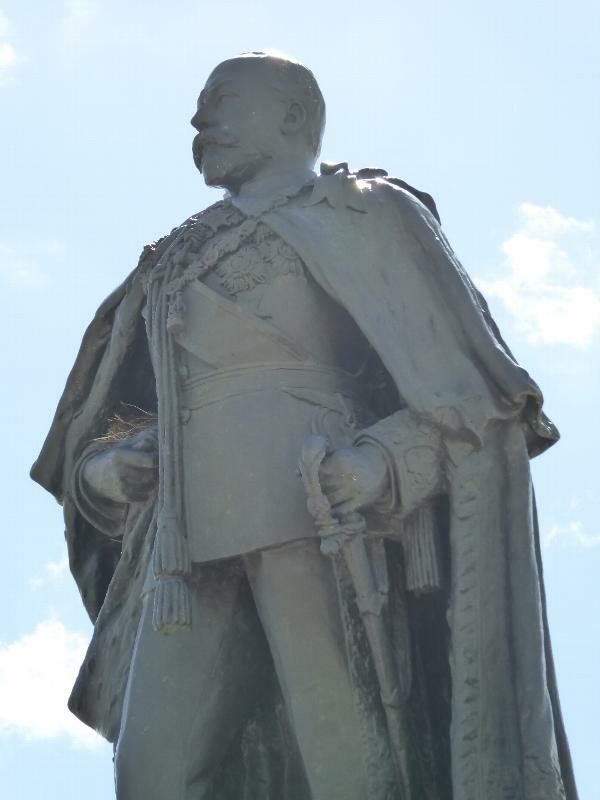 Prince was appointed to the staff of the Immigration Department in 1854, when he was about 18. He became a police inspector three years later and superintendent after another three. His salary at that time was 500 pounds annually, plus 100 for a horse allowance. 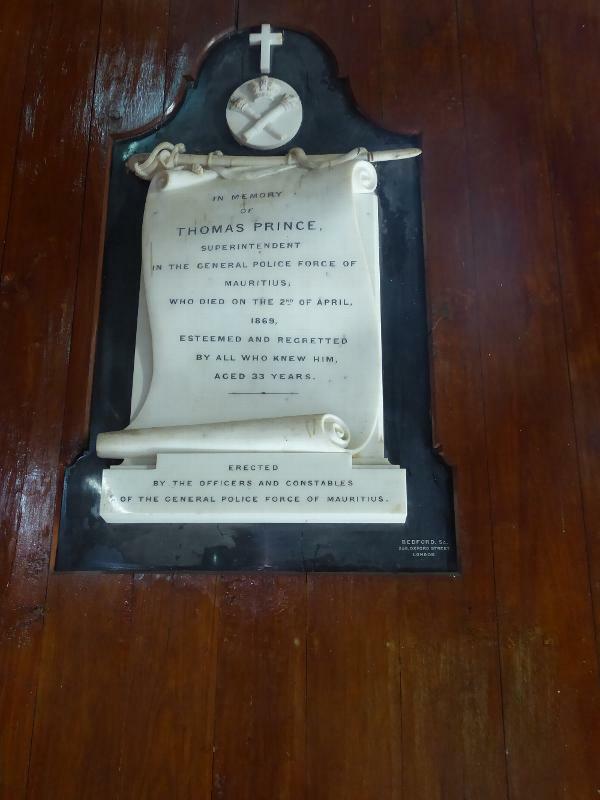 Prince collected his handsome salary for nine years before dying at 33. See The Mauritius Almanac and Civil Service Register, 1865, p. 40. A really old timer. 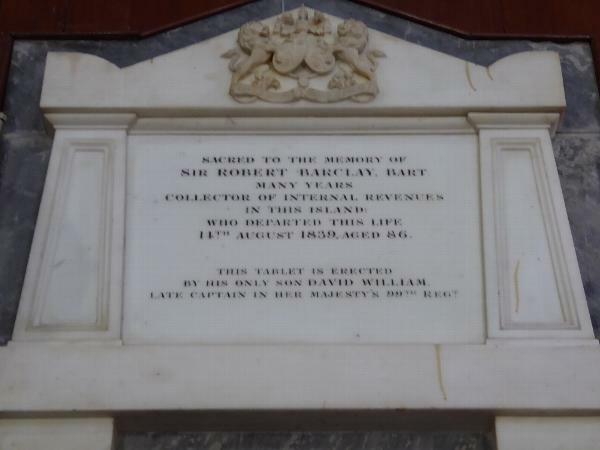 Sir Robert was a cousin of the banking Barclays. In Europe in 1798, he was arrested by the French and held for a year as a spy. 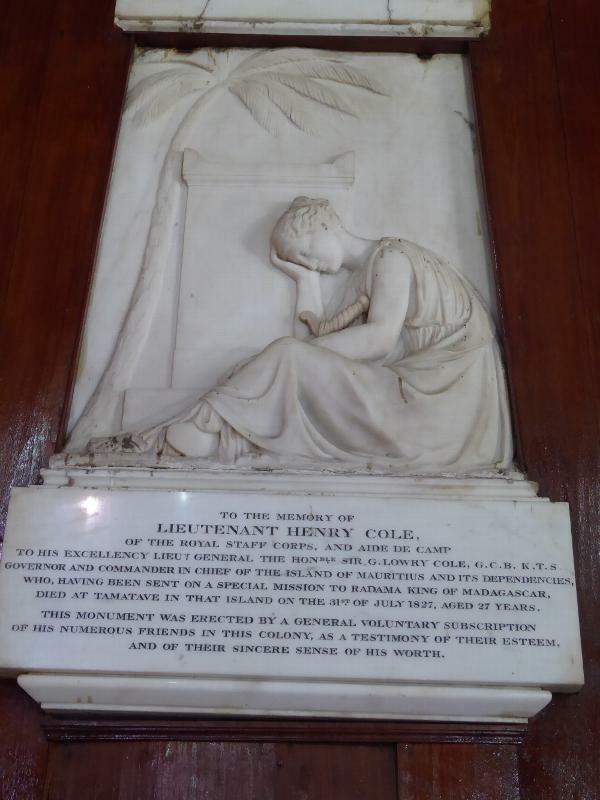 He then served in the British parliament from 1802 to 1807. 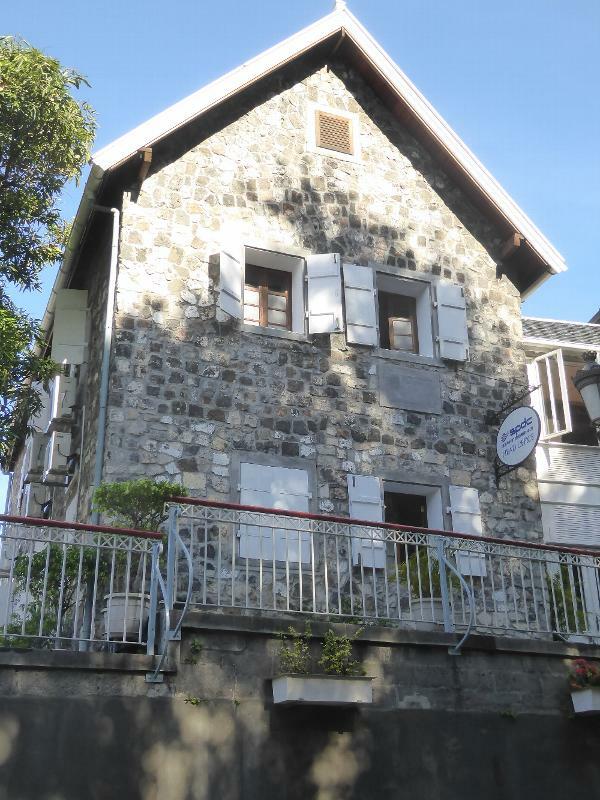 The official history of that institution records that "his affairs were in some disarray when in 1813 he obtained a place in Mauritius. Shipwreck on arrival there, 30 Jan. 1814, disposed of his effects. He wrote home to beg for an additional 500 p.a. to recoup himself. 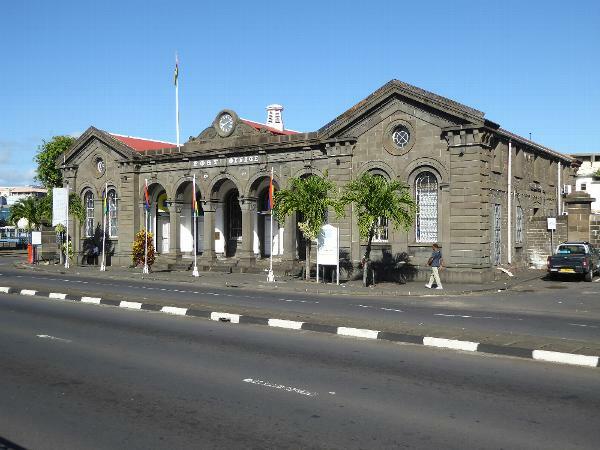 He was not implicated in the scandal of peculation among Mauritius officials that burst in 1823, and had got over his financial difficulties by then. 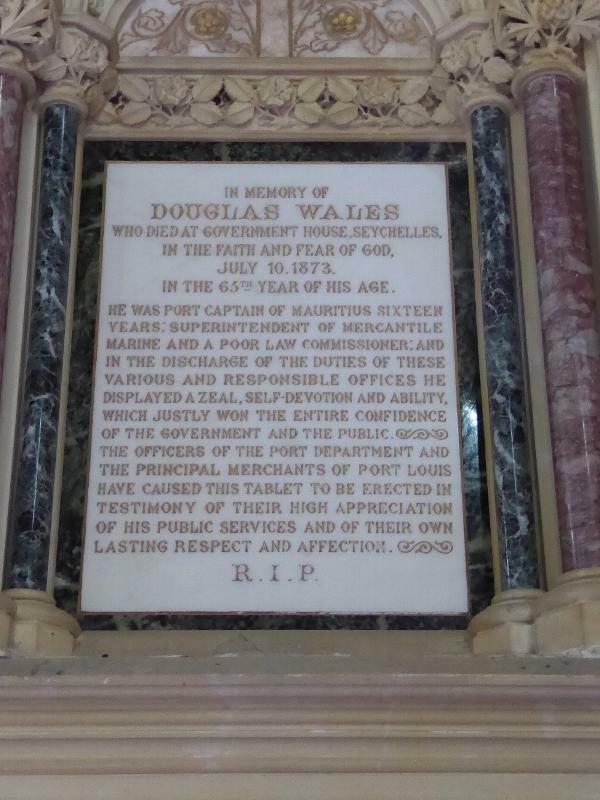 He remained on the island as partner in a wine shipping business and died 14 Aug. 1839." Muslim traders were very important by the mid-19th century. 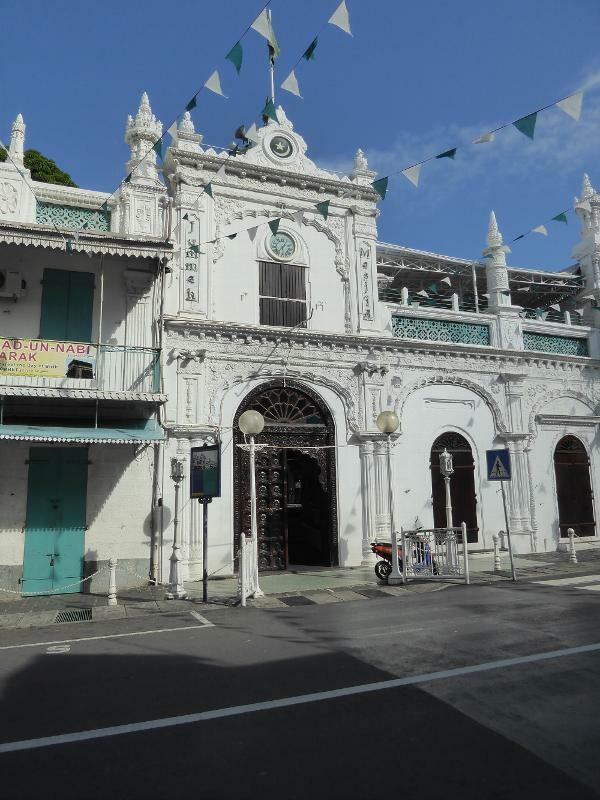 For them, the Jummah Mosque, shown here, was built smack in the city's commercial center. 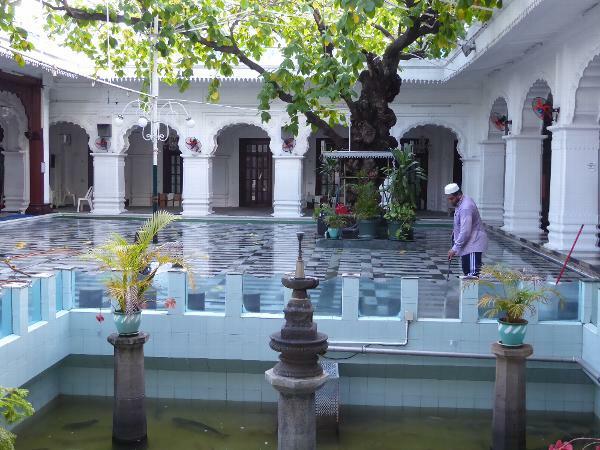 Begun in 1852, the mosque was not completed until 1895. 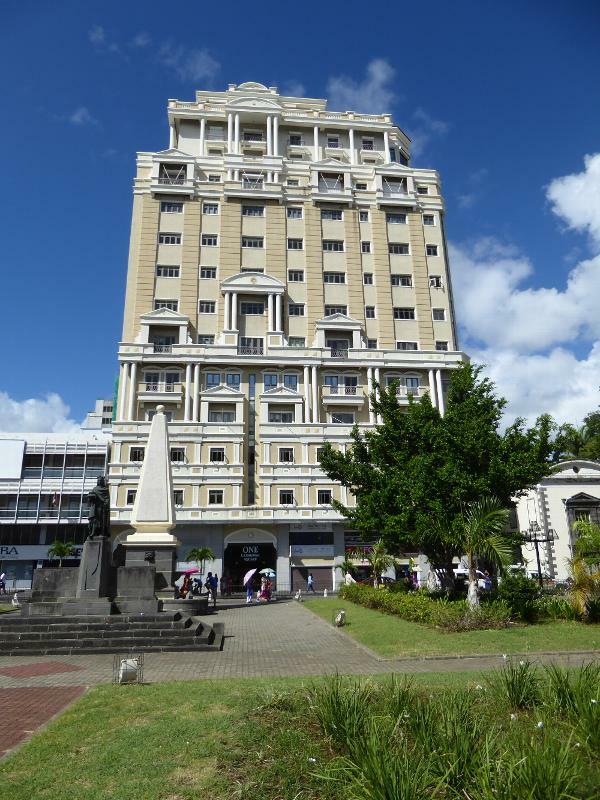 Several older buildings were incorporated into the structure, which was supervised by architects from India. 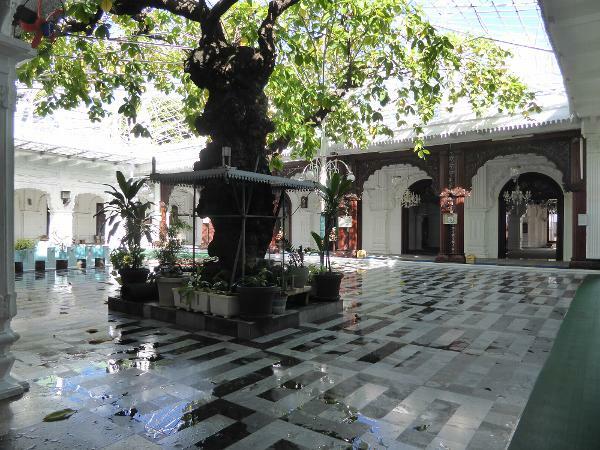 The prayer hall is off-limits to non-Muslims, but the courtyard is open. It's an especially welcome refuge in today's traffic. 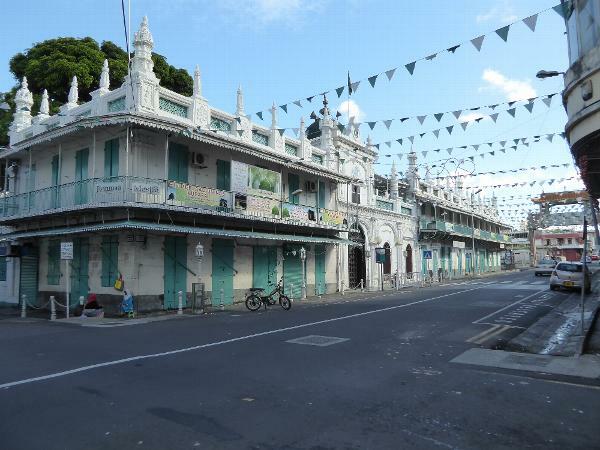 Muslims comprise about 17 percent of the island's population. 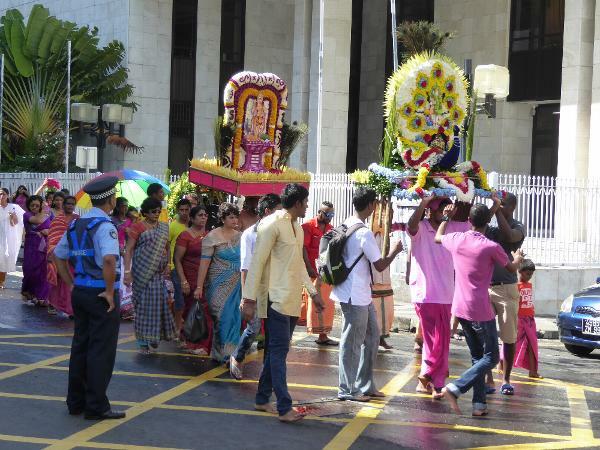 Meanwhile there's the Hindu population, here participating in the Thaipoosam festival, marking the occasion when Parvati gave Murugan a spear to vanquish the demon Soorapadman. 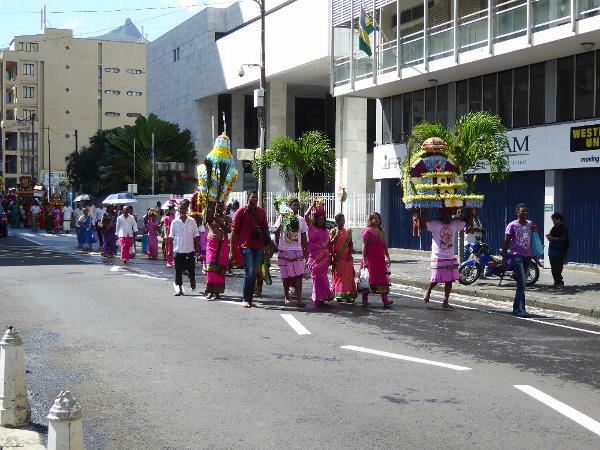 Hundreds of cavadees ("burdens") are carried through the streets here and elsewhere in the island. 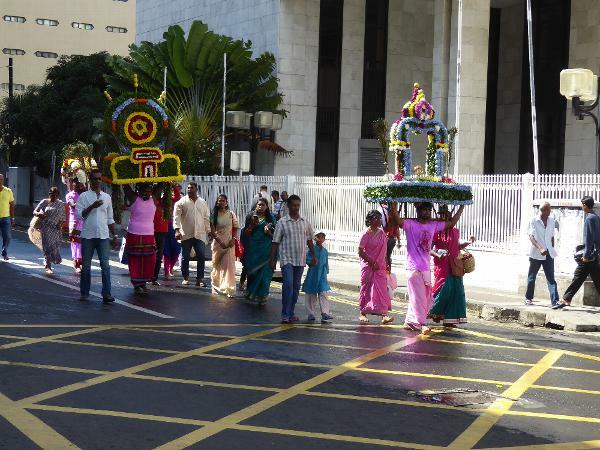 The cavadee is an offering to Murugan and is destroyed at the conclusion of the ceremony. There's tremendous variety in these cavadees, and pride. Men, women, children all get involved. There's less inventiveness in the statuary on display in the Company Garden. 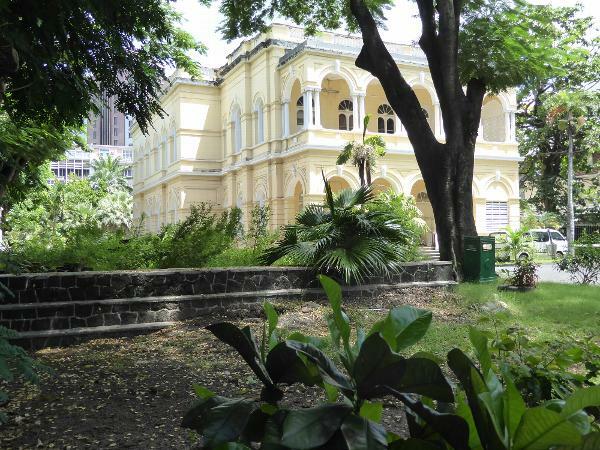 That would be the garden of the old French East India Company. Still, take a look. 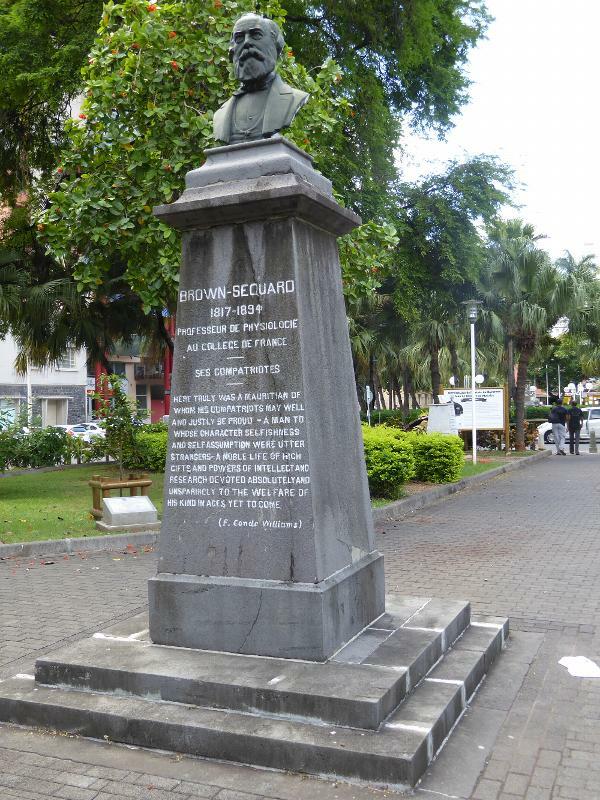 Here's Adrien d'Epinay, the founder of the National Committee for Defence of the Interests of the Mauritian Plantocracy. Translation: he was opposed to the abolition of slavery. D'Epinay couldn't prevent abolition, but he did manage to negotiate compensation, and slave owners were paid a bit over half of the market value of their slaves, who were valued at four million pounds. 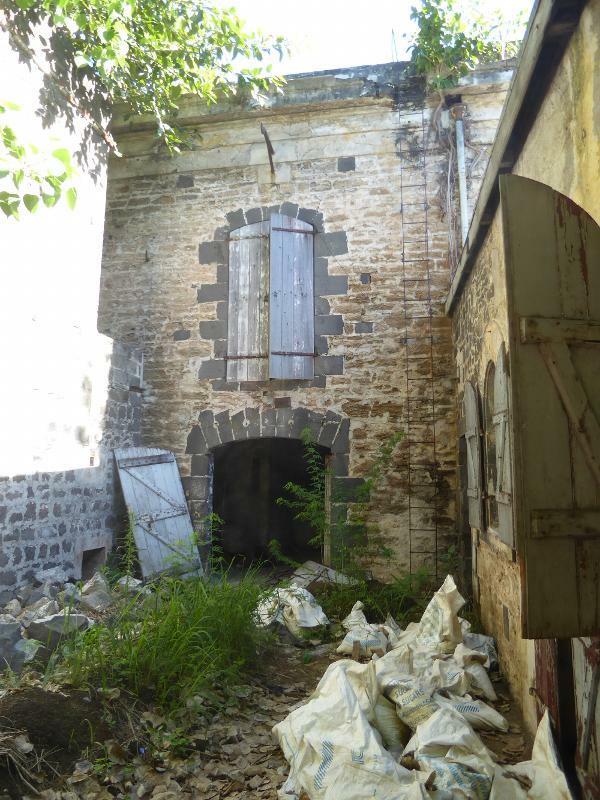 D'Epinay must have done all right for himself, because thirty-some years later he built the island's first steam-driven sugar mill at Argy, over near the island's east coast. 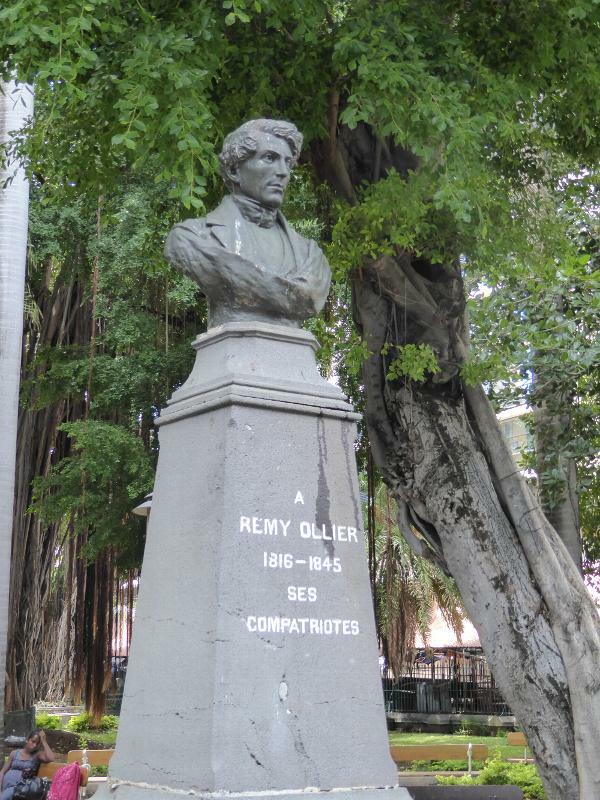 From the other side of the tracks, Ollier was the son of a French captain and a freed slave. 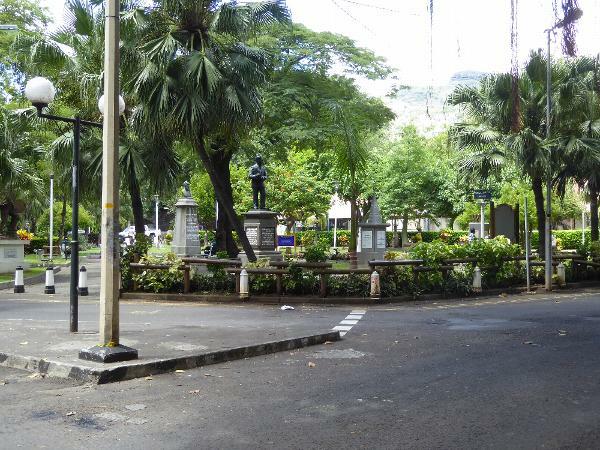 He became a journalist and founded The Sentinal, a paper fighting for the Creoles, a group generally understood in Mauritius to be the descendants of slaves. 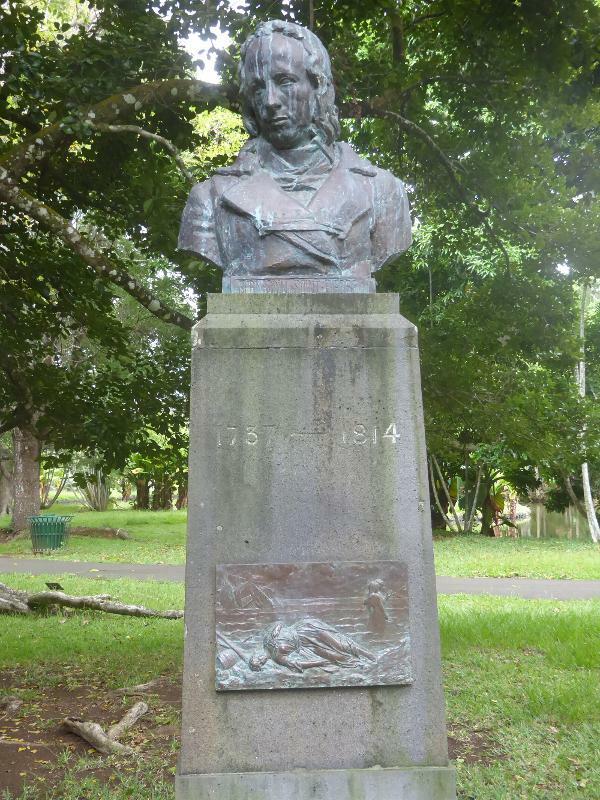 Raoul Rivet (1896-1947) wrote for Le Mauricien, supported the rise of Ramgoolam, and, as the quotation on the stone suggests, was devoted to France. In fact, he became a knight of the French Legion of Honor. The garden also recalls cultural leaders. 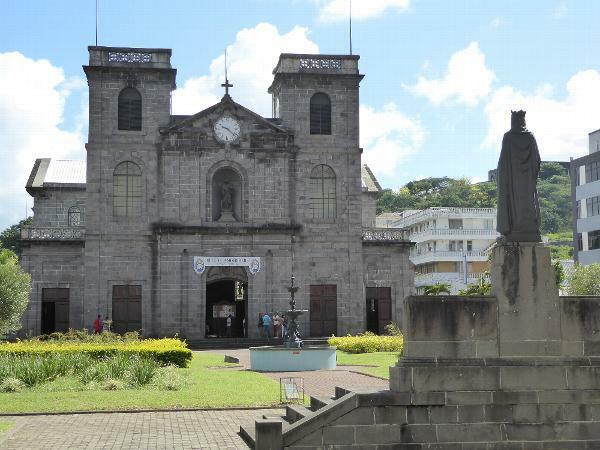 The best known of the writers is Bernardin Saint-Pierre, author of the once very famous Paul and Virginia, a 1788 novel set in Mauritius and featuring a child of nature corrupted by the French elite. 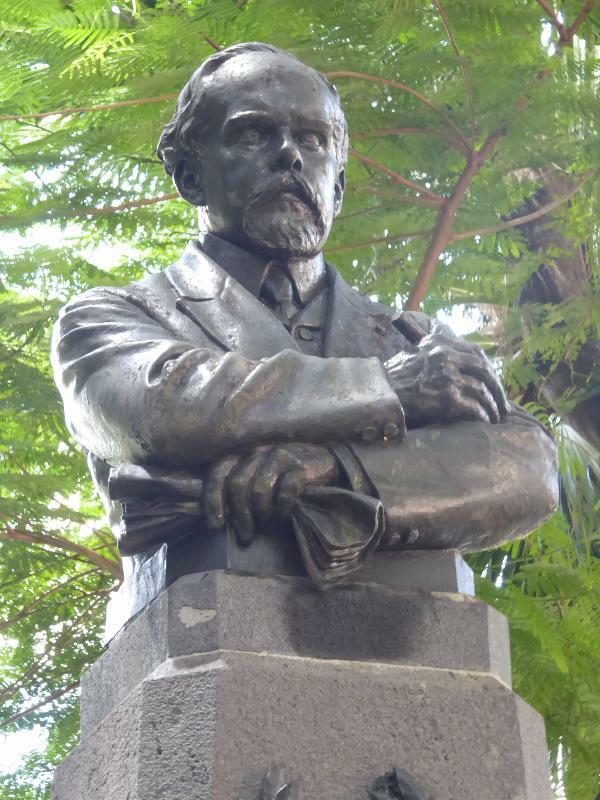 Here's Leoville l'Homme, 1857-1928, the father of Mauritian poetry. 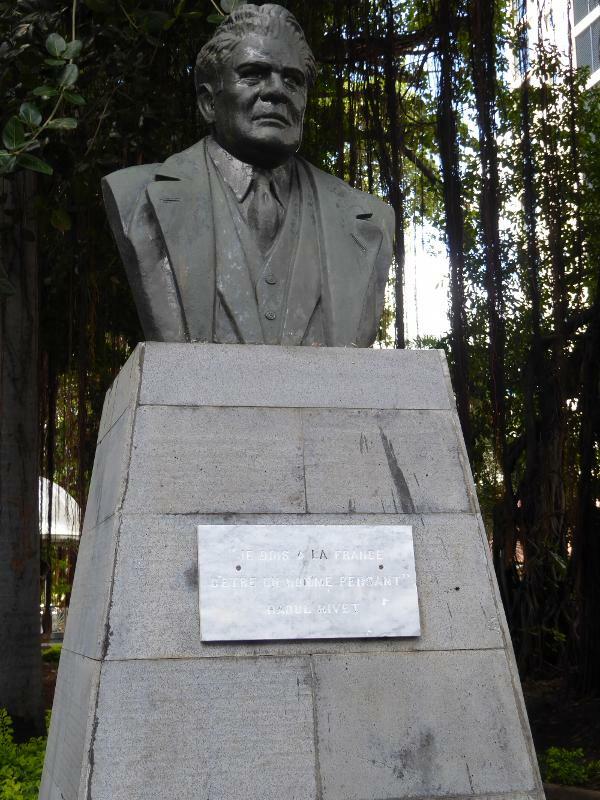 Here's the island's most famous scientist, a pioneer in the study of spinal-cord injuries. Charles Edward Brown-Sequard spent most of his life, however, in London, Paris, and the United States. So, more or less, did this fellow. 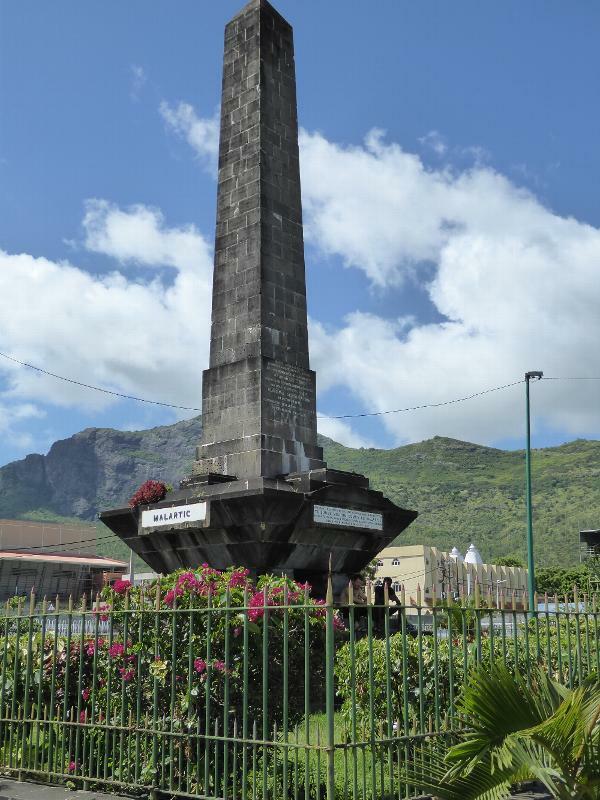 The statue was the work of another Mauritian expat, Prosper d'Epinay, son of Adrien. The statue is placed at the center of the Turf Club's track, which we saw from a hilltop 70 pictures back. It's a bit lonely, but royalty always is. Edward shares the grounds with a monument to Count Malartic, the penultimate French governor (1792-1800). Old photos show the obelisk lying on the ground after it was blown off its base by the cyclone of 1892. By then, the capital's Europeans had moved uphill a few miles. 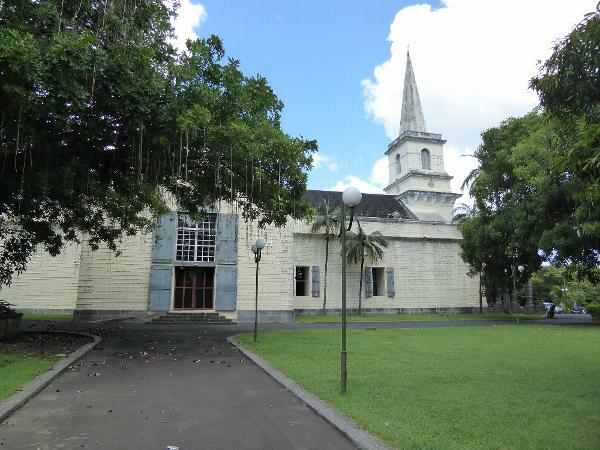 Here's the main church they built at Curepipe. It's the Eglise St. Therese. Definitely a church built for warm weather. 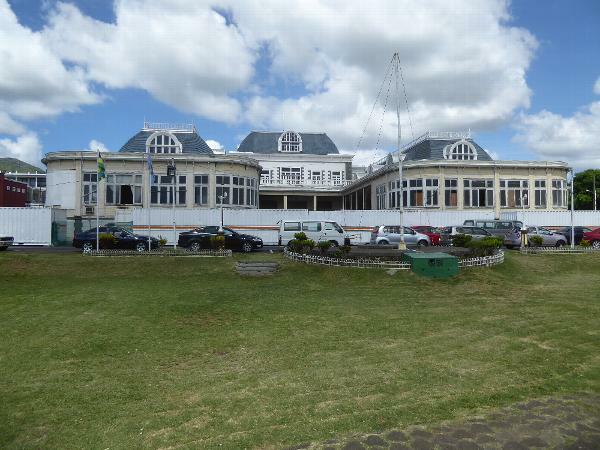 There was a college here, too: the Royal College, Curepipe. The main building, shown here, was rebuilt in 1912. 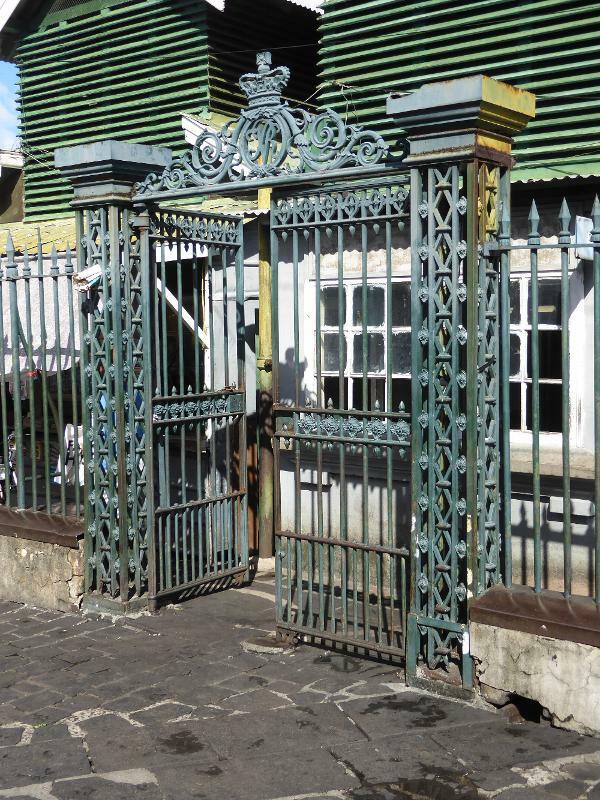 The Mauritian coat of arms appears on the school's gate, along with the Latin for "Star and Key of the Indian Ocean," the island's motto. The town hall, under renovation in 2016, was an old house taken apart and reassembled here in 1902. Here's a combination town hall and theater (the Plaza) opened in 1927 for the combined villages of Beau Bassin and Rose Hill. 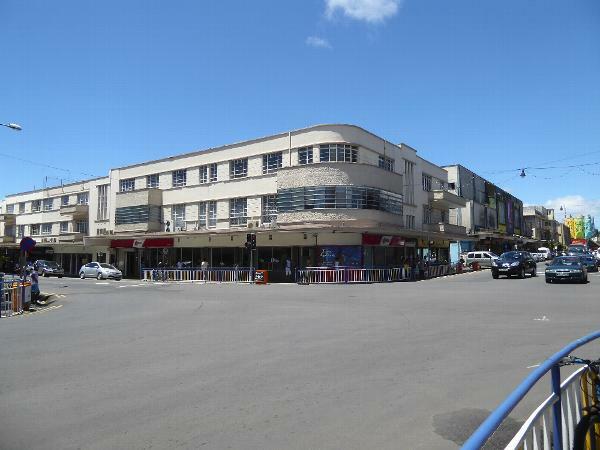 Curepipe's most fashionable shopping center in the early days opened in 1912 as C. Guillemin and Co.
Across the street, the Merven Building was a streamlined pioneer in the use of reinforced concrete. 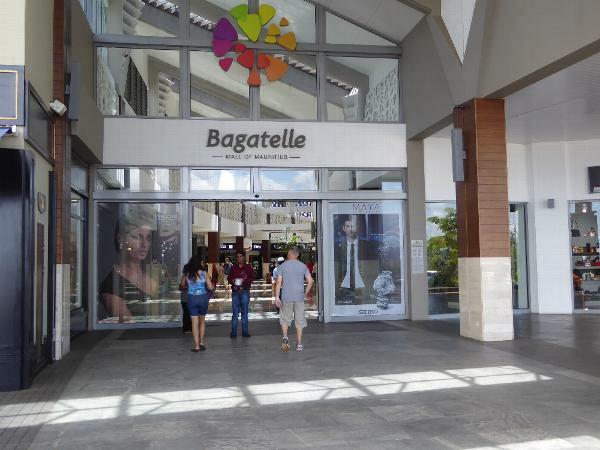 Shoppers who demand air conditioning now prefer one of the island's several shopping malls.